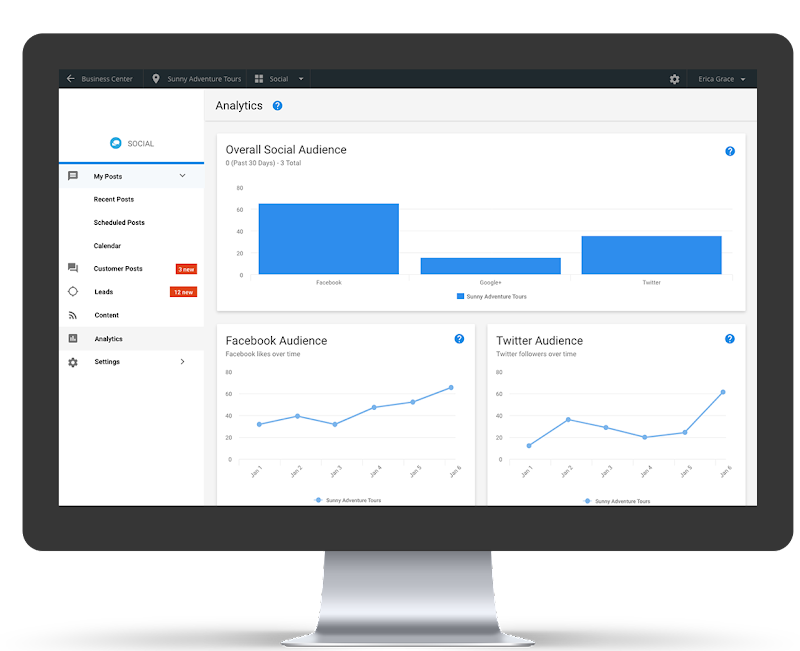 White-label social media management software for agencies. Social Marketing is a white-label social media tool made for agency-to-client collaboration, allowing your team to manage local businesses’ social media accounts in a scalable and transparent way. Social Marketing is adaptable to any service model, so it works great whether you’re offering DIY solutions or managed services. 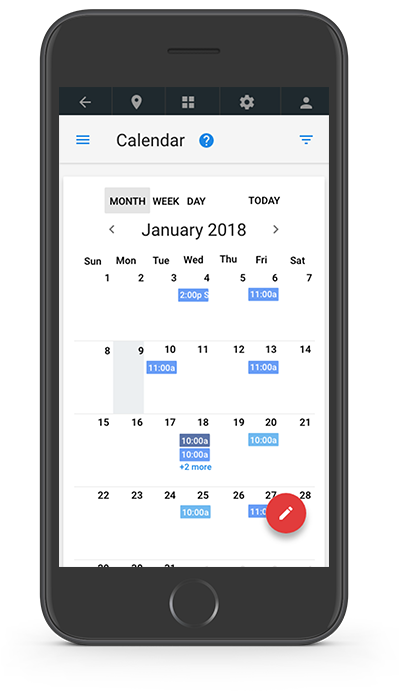 With an all-in-one composer and a social post scheduling calendar, you and your clients can efficiently schedule social media posts to Facebook, LinkedIn, Twitter, Instagram, and Google Search (via Google My Business). Plus, with a built-in stream of industry-related content, it’s easier than ever to discover something great to post. You can even generate local leads for your clients with a Twitter lead finder that monitors keywords within your local area. Best of all, Social Marketing is a white-label tool that you can sell as your own, helping you build brand recognition, credibility, and trust. 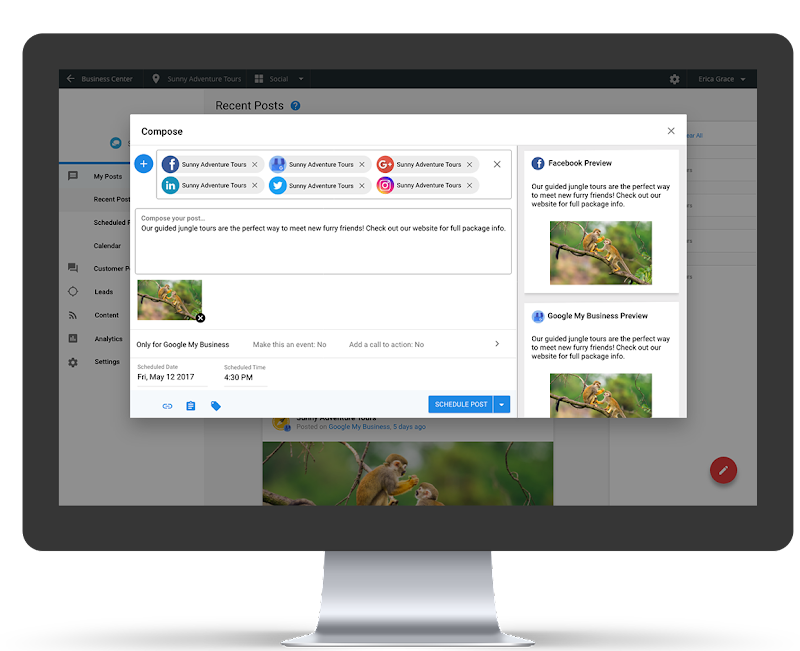 Post everywhere from one place: Social Marketing provides one place to publish and schedule posts for all your clients' social accounts. Engage your followers: Social Marketing makes it simple to connect with your clients' followers. 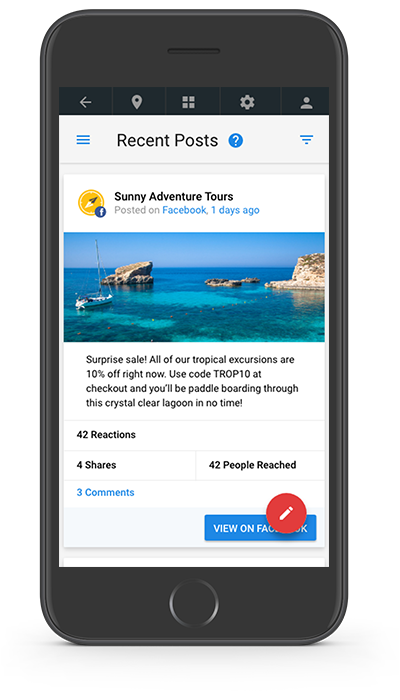 Respond to their customers, share ready-to-post content, and build stronger social relationships with followers. Generate social leads: Discover new leads on Twitter and engage them with the click of a button! Social Marketing is 100% white-labeled, so you can slap your brand on it, mark it up, and start generating instant ROI. Social Marketing adapts to the level of involvement each unique client needs; Manage their social media on their behalf, or empower them to do it on their own. With Concierge—a service management tool baked into the Vendasta Platform—your team can manage all of your clients’ social accounts at scale. No other social media management platform provides a scalable agency tool like this. Social Marketing gives local businesses one place to publish and schedule posts for all their social media accounts. Social Marketing enables local businesses to build deeper relationships with their customers. 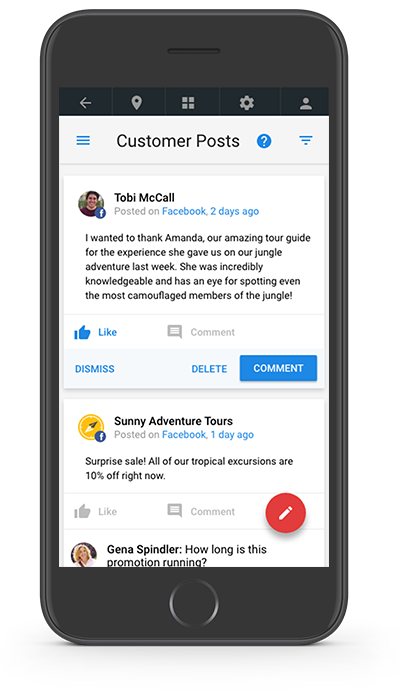 They can discover and respond to customer comments or share interesting and relevant content—all from a single social media management tool. With Social Marketing, your clients can discover new leads on Twitter and engage them with the click of a button. 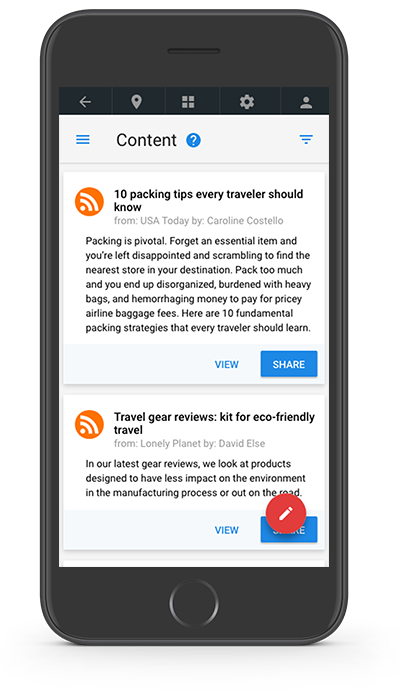 Social Marketing works great and looks beautiful on any device, so your clients can post fresh content and respond to customers on the go. With Social Marketing, you can display your branding right within the software, so your clients will always know who they’re dealing with. 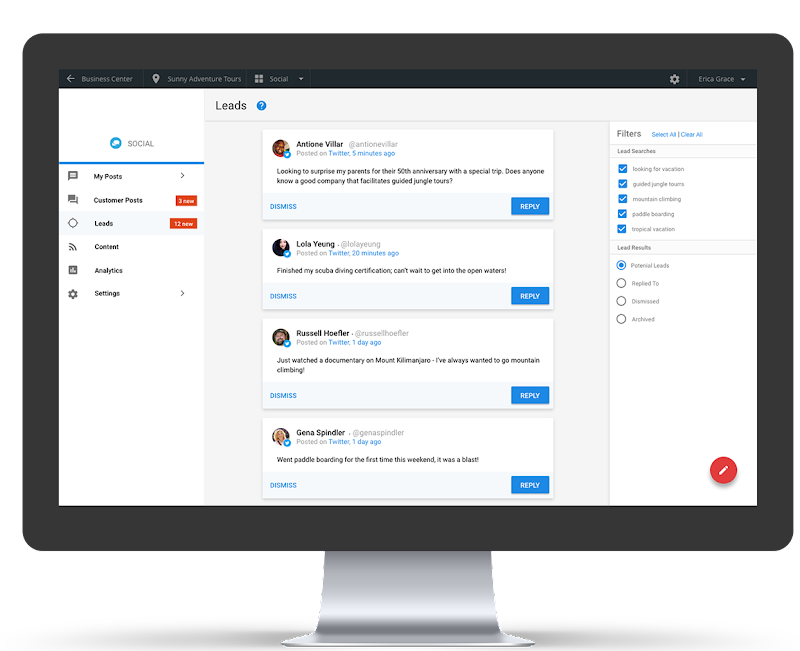 All the social media management tools you need in one great app. White label Brand the software using your agency’s logo and colors. Professional page setup for local businesses with logo and company information. A monthly calendar of two written posts/week on Facebook, Twitter, Google+, and LinkedIn. Resell social marketing under your agency’s brand and price. It’s easy. Create your free account. Build your online store. Generate leads with our automation tools. Start selling.